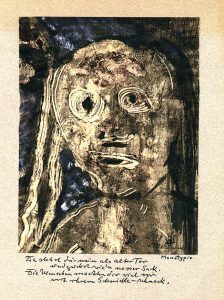 After exploring the artistic possibilities in the field of non-objectivity, the beginning of which goes back to the immediate post-war period (1947), Schenk turned back to an objectivity in the early sixties, but this is not comparable to the concrete painting or graphics of his earlier presentation. 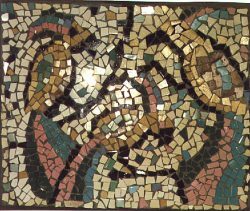 He developed a special liking for coarse textured mosaics, of which only 3 are still present. As his last great work he created a polyptichon “Kirmes” (WV 759). 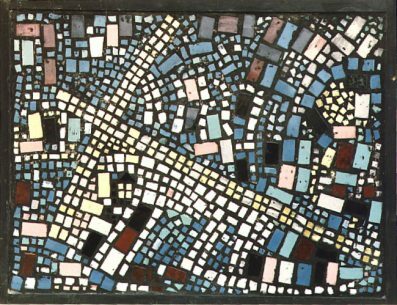 There are 5 individual parts, each 110 x 40 cm, tempera on wood, created about 1974, the middle part of the origin and not yet was divided; then Schenk painted the two outer panels and divided the middle area.